Aid Climbing: The technique of using gear to support your weight as you climb. As simple as using a bolt as a single hold, or as complex as climbing an entire route with full weight on your gear. Traditional climbing - Traditional or Trad Climbing involves rock climbing routes in which protection against falls (cams, nuts, etc. placed in cracks and pockets) are placed by the climber while ascending. 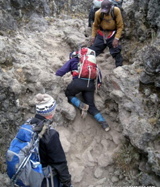 Gear is used to protect against falls but not to aid the ascent directly. Big Wall Climbing - In the past these were routes of 10 or more pitches which required several days with bivouacs spending the night on the wall. Speed climbing techniques have now allowed many of these to be climbed in one day. The classic big walls are Half Dome (2,000') and El Capitan (3,000') in Yosemite. Slathe Wall on El Cap is 35 pitches. Crack Climbing - Climbing along one long vertical crack. Sport Climbing - Unlike Traditional Rock Climbing, Sport Climbing involves the use of protection (bolts) or permanent anchors which are attached to the rock walls. Bouldering - Climbing on short, low routes without the use of the safety rope that is typical of most other styles. Protection, if used at all, typically consists of a cushioned bouldering pad below the route and/or a spotter, a person who watches from below and directs the fall of the climber away from hazardous areas. Bouldering may be an arena for intense and relatively safe competition, resulting in exceptionally high difficulty standards. Free soloing (not to be confused with free climbing) is single-person climbing without the use of any rope or protection system whatsoever. If a fall occurs and the climber is not over water (as in the case of deep water soloing), the climber is likely to be killed or seriously injured. 1900 - Climbing separated from Mountaineering around 1900. 1920's - British climbers had carried pebbles in the pockets of their knickers, slotting these chockstones into wide spots in cracks and tying them off--with scary-looking hemp cord--for pro. 1930 - Francis Farquahr, editor of the Sierra Club Bulletin, learns European rope techniques from Robert Underhill while climbing in British Columbia and asks him to write an article in the Bulletin, which arouses interest amongst bay area mountaineers. 1945 - Swiss born John Salathé, a blacksmith in San Mateo develops hard steel petons and pioneers aid climbing. 1961 - Summit Magazine article, "Are Bolts Being Placed by Too Many Unqualified Climbers?" emphasized that bolts cause permanent degradation of the rock. This is the start of the clean climbing movement. Europeans had been using slings around chockstones and large nuts found along railroad tracks by wedging them into cracks for some time. 1972 Chouinard Equipment catalog, which introduced a new line of climbing nuts. Clean climbing became even easier when Ray Jardine introduced his spring loaded camming devices, called Friends, in the mid 1970s. 1970 - Warren Harding and Dean Caldwell (no relation to Tommy) became the first to ascend the "Wall of Early Morning Light," now better known as the Dawn Wall, using aid-climbing techniques. The Dawn Wall is El Cap's steepest and tallest, and considered the most dangerous. The two garnered national news attention by refusing the National Park Services rescue attempt after a nasty four-day storm, instead offering them wine. The grade has to do with the length and seriousness of the route, ranging from "Grade I - one to two hours of climbing" to "Grade VII - a climb lasting a week or longer". The class of a route is derived from its "crux" or hardest move. If you hike a class 2 trail from point A to point B, and are required to scale a 20 foot wall of rock (class 4) along the way, then you hiked a class 4 trail regardless of the normal exposure. Class 1: you fall, you're stupid. Class 2: you fall, you break your arm. Class 3: you fall, you break your leg. Class 4: you fall, you are almost dead (i.e., you can't breath and move your arms, legs, and head). Class 5: you fall, you are dead. thick brush, climbing over and around fallen trees, and big talus - hands are used for balance. class 3 Steeper climbing with handholds, some exposure, usually no need for a rope. You can down climb facing out from the route. class 4 Steep, exposed, but easy climbing with rope for safety. Use a rope to avoid serious injury on a fall, but don't place protection. 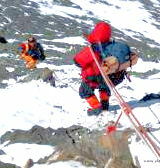 A rope is often used for down climbing (rappelling or abseiling). Falls may result in serious injury or even death. class 5 Technical rock climbing (Free Climbing) - specific climbing moves necessary, with a rope and intermediate protection necessary. In theory, class 6 exists and is used to grade aid climbing (where progress is made by climbing directly on equipment placed in or on the rock and not the rock itself). However, the separate A (aid) rating system became popular instead. 5.8- 5.9: Most weekend climbers are comfortable at 5.8 and can push to 5.9. 5.10: A dedicated climber in good shape. 5.11- 5.12 Expert - Climber who trains reguraly and has natural ability. * 5.10 used to be 6.0, That is, a route that could only be done as "aided", but became "technical" as improvements in equipment and technique evolved. 5.11 - 5.14 were added as people pushed the limits. A1 or C1: Aid placements are solid and easily placed. A2 or C2: Placements are awkward to place and hold less. A3 or C3: Aid placements will hold a short fall. A4 or C4: Aid placements only hold body weight. A5 or C5: Entails enough A4 placements to risk a substantial fall. G - Good, solid protection ground up. PG - Pretty good, few sections of poor or non-existent placements. R - Runout, some protection placements may be very far apart. X - Little or no trustworthy protection, extremely dangerous. The North American Grading System. In North America, grades denote the normal amount of time required to complete a route. This time is based on a team of average climbers using normal techniques. Grade I - easy excursion. From a single pitch up to a few hours. Not particularly committing. Grade II - Bit more serious, but less than a half day climb. You could get a few II's in in a day if you worked at it. Grade V - A day or two. Moonlight Buttress in Zion. Grade VI - A few days. The Nose is a grade VI climb. Grade VII - Expedition - Bring a gallon of tequilla, you'll need it. The British rating system - The Brits have two different ratings (they say grades): an adjectival grading and a technical grading. The adjectival grading says something about the overall difficulty of the climb. The technical grading says something about the most difficult move of the climb. So, an easy climb with a difficult move would have a relatively low adjectival grading with a high technical rating (like E4/6c). A sustained climb with long runouts and poor pro - a real British climb - but no real difficult technical moves has a high adjectival rating with a low technical rating (like E7/6b). Rhapsody, the direct finish to Dave Cuthbertson's 1983 route Requiem (E8 6b) at Dumbarton Rock NW of Glasgow, was given the grade of E11 7a (trad f8c+ US 5.14c). Scottish climber Dave MacLeod, established it in 2006. 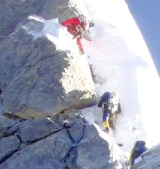 The film E11 documents the climb. The Union Internationale des Associations d'Alpinisme (UIAA) rating scale, an ill-fated attempt at international standardazation, is used mostly in Western Germany and Austria. The Angeles Sierra Club Chapter system on the hike ratings page. Belay: a system of setting up the rope to hold a climber in the event of a fall. A procedure that manages the rope by taking in or letting out slack to minimize the seriousness of a fall. Usually performed by a second person with a belay device to provide friction on the rope. The belayer may stand freely below the climber in the case of top-roping or be fastened to an anchor point to support a leader fall or when belaying from above. Chalk: Magnesium carbonate gymnastic chalk used to absorb sweat, resulting in increased adhesion to holds. Chock: A stone or object that becomes wedged in a constriction point in a crack, or more commonly for climbers: passive wired protection devices, called nuts, stoppers, wires, hexes, etc. Clean: A) climbing without the use of pitons, bolts or anything requiring a hammer. B)Climbing without falling or hanging. C) removing equipment from a climb. Free Climbing: the technique used when ascending a pitch using only hands, feet and body English, while placing gear for protection only. Free solo: Climbing without using ropes for protection. A fall usually implies very serious injury or death. HMS Carabiner: Halbmastwurfsicherung carabiner. Pear-shaped carabiner which due to its wide top is great for belaying from and setting up belays on. 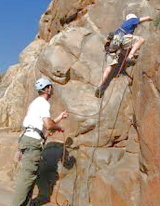 Lead climbing occurs when the climber (and the Rope) start at the base of the climb. Protection is placed periodically throughout the climb to reduce the distance that the climber can fall. PAS - Personal Anchor Systems - a piece of climbing gear meant to secure you directly to the anchors of a route. This is done using the PAS and two locking carabiners. Personal anchor systems are most commonly used when cleaning a route (removing gear from a climbing route). Pitch - A distance climbed with one length of rope, also determined by locations of shelfs or belay points. Protection: A point of security such as a chock, piton, bolt or other device where climbers can clip in. Rack - A collection of gear used for climbing. May be also known as sport rack or trad rack dependent upon what kind of gear it consists of. Sport climbing: Climbing well bolted or pre-protected routes. Sport climbing often implies difficult to extreme single pitch face climbing. Soloing: Climbing alone, usually without protection. Trad: Traditional climbing, characterized by the placing of protection (cams, nuts, etc.) in cracks and pockets. Trad also includes multi-pitch routes often with long runouts. Fifty-one climbers died in Yosemite from traumatic injuries between 1970 and 1990. THere are at least 50 fractures per year), and a much larger number of cuts, bruises, and sprains. Most Yosemite victims are experienced climbers, 60% have been climbing for three years or more, lead at least 5.10, are in good condition, and climb frequently. Short climbs and big walls, easy routes and desperate ones: all get their share of the accidents. one-third of serious leader fall injuries were because they did not place enough protection and two thirds were from protection failure under the force of the fall. Crag Utility makes a comparison between various international grades.